Mobility impaired hunters will again be treated to a unique opportunity to attend two special deer hunts this year on about 60 well-managed and exclusive, private tracts of land in the Upstate. The hunts are scheduled for Oct. 28-29 in Cherokee, Spartanburg, and Union counties, and on Nov. 4-5 in Laurens and Newberry counties. Applicants can apply for one or both hunts. There is no application fee or other cost associated with these hunts. Each hunt will consist of a noon lunch and hunting on Friday afternoon and Saturday mornings. After the noon lunch on Friday, all participants will then disperse to their assigned hunt sites. Applications for these special hunts are available from: Union DNR Office, 124 Wildlife Drive, Union, SC 29379, telephone (864) 427-5140, fax (864) 427-8460; or the DNR Columbia Office, PO Box 167, Columbia, SC 29202, telephone (803) 734-3886. You can also download an application from the DNR website at www.dnr.sc.gov/hunting/mobilityhunt. Completed applications must be received at the Union DNR Office by 5 p.m. Monday, Sept. 12. Applicants for these hunts are carefully screened and are restricted to persons who are permanently and severely mobility impaired. These include only those who are permanently confined to a wheelchair, persons permanently requiring the use of a mechanical aid (walker, braces, cane, etc.) to walk, or persons with complete single or double leg amputations. Each hunter may be accompanied by one other person who can participate in a non-hunting capacity. These special hunts are co-sponsored by the S.C. Department of Natural Resources (DNR), which will handle the application process, notification of successful hunters, and other correspondence. A number of generous landowners and managers will accommodate hunters on their properties this year during these special hunts. Additional hosts may be added prior to the hunt. A number of organizations are also co-sponsoring these events and provide financial support or assistance in various other ways. These co-sponsors include the Harry Hampton Memorial Wildlife Fund, Georgia Pacific Corp., Carolina's Fence Association, South Carolina Disabled Sportsmen, Paralyzed Veterans of America, Sprinkle Prosthetics, the Upstate Warrior Solution, South Carolina Wildlife Law Enforcement Officers Association and the South Carolina DNR's Take One Make One program. A significant number of volunteers are involved whose individual personal assistance is vital to the success of these events. 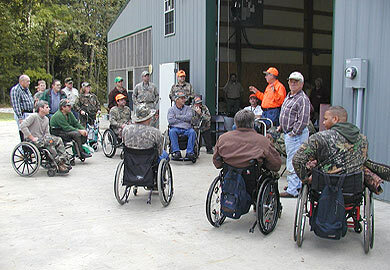 "Aside from the opportunity to hunt deer on some of the most well-managed and exclusive properties in the Upstate, another important benefit of these events is the opportunity to develop friendships and fellowship among those who have similar disabilities,” said Gerald Moore, DNR wildlife biologist in Union. “We are pleased to cooperate with the various hosts and sponsors of these hunts in assisting those people who are able to take definite steps to pursue their outdoor interests in spite of their disabilities." Moore encourages all qualified mobility impaired persons interested in hunting to apply. "It is certainly a great opportunity,” he said, “and all interested sportsmen and sportswomen who are mobility impaired should try to take advantage of it."